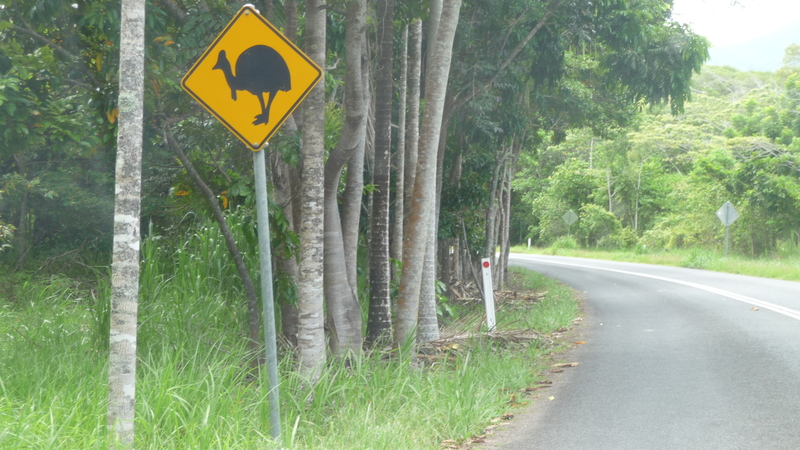 With some trepidation we rented a car in Cairns and headed out to see what else we could love about northern Queensland. You know how it is when you have a sweater that you really like and you wear it so much you realize you need to get another one? And the feeling of dread when it’s time to go shopping? And when you get to the store, you look at all the other sweaters and think, Well, you’re okay, but I’ll never love you like I do my real sweater? That’s the feeling I had leaving Cairns, but then I went shopping and found I could love another sweater. Two other sweaters, in fact, Yungaburra on the Atherton Tablelands and Cape Tribulation. Anyway, so we got ourselves wedged into this tiny little car, and on the very first try I got the right road out of town. We wound our way south for a bit, then turned inland. In less time than I expected when zipped into, and then out of, our destination, Yungaburra. Rory said, witheringly, “You’re not lost again?” I assured him I wasn’t, that I had every intention of scoping out the town and then passing right through on the way to, um, yes, this attraction signposted ahead. 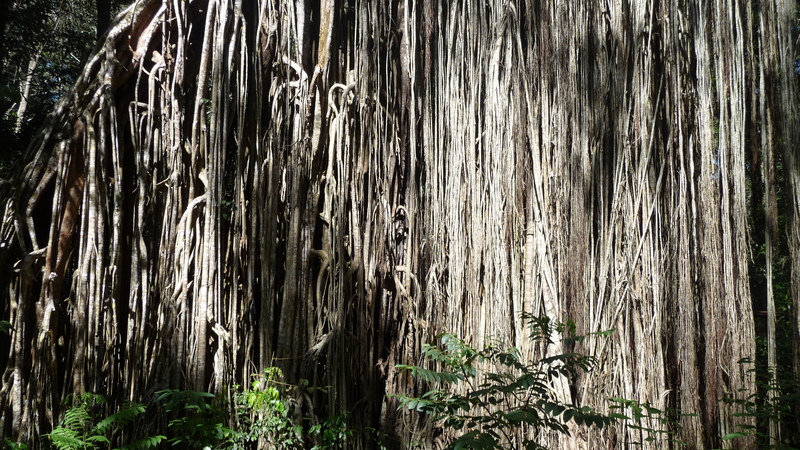 Thus, we found ourselves at the Curtain Fig. This is a tree that started life as a modest strangler fig, a tree that uses another, bigger tree as a crutch, then eventually kills off the crutch. This tree just kept on going, one crutch after another, until now it’s freestanding with a massive trail of vines that look like, well, a curtain. Was this fascinating to my two young companions? Heavens, no. The lizard on the tree, however, they could have looked at all day. 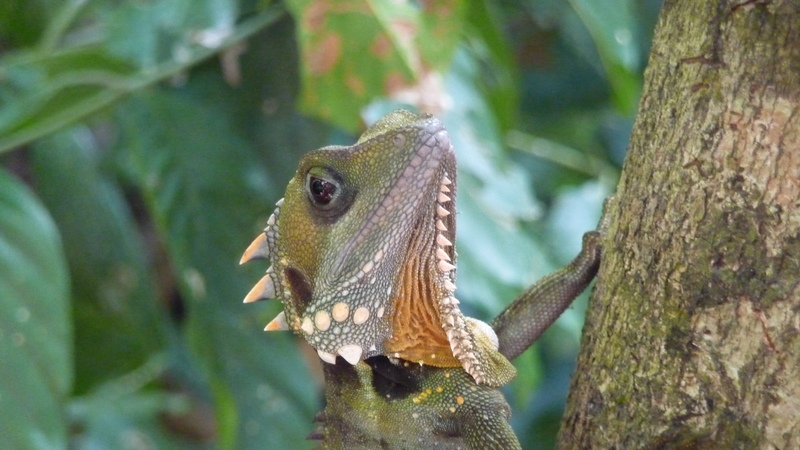 It was a Hoyt’s Forrest Dragon (I hope I’ve got that right), and it was pretty cool. It turned its head and looked around, kind of in a creaky way, just enough to let you know it was still alive. We made our way back into town, and managed to find our way straight to a playground. Waiting on top of the slide were not one, not two, but three boys wearing Ben 10 t-shirts. In no time Rory was at the center of the action. The boys flatly refused to believe that we had really come all that way from America. Rory had me go over to the group to testfy, but they seemed to still have their doubts. THey just couldn’t believe it. It was great. We’ve been moving around so much, hanging out with other travellers from all over, that it was so wonderful to have a small group of kids remind me that, yes, we had really, truly come half way around the world, and that’s a big deal. What an amazing thing, seen with such clarity. One even said, “You came all this way to play on our playground?” Well, little Yungaburran, we sure did. We moosied over to the hostel after that. We had planned to camp in their backyard, but chance of rain made an easy excuse for me to go spring for an inside room. This place, On the Wallaby, is what a hostel should be like. Great spaces to eat and hang out in, a kitchen that was well-stocked and (shock!) clean. Out back there was a ping pong table, and they kept Rory and Nora endlessly supplied with ping pong balls, no extra charge. There was no tv, no clocks, no bank of computers lined up. There were cool people like Florence and Madeleine (who squeezed themselves into our car to go swimming with us in a volcano crater lake) and Scott (our first fellow North Carolinian) and Damien and Sergio, the guys who kept the place going. It was the kind of place that makes you realize how lonely travel can be, other times. There was a mango tree with messages written on the fruits and there were huge wooded tables where meals were shared and there were free rides to see duckbilled playpuses paddle around in a creek. Can you tell we loved this place? The morning we left Damien played Beastie Boys and the kids had a dance battle. It was hilly and green and almost always warm. It was a smaller, more tropical Asheville. It was tough to go. We left heading north, past Cairns up to Cape Tribulation. Unless I’m wildly mistaken this is the only place inthe world where two World Heritage sights meet. The Daintree rainforest comes right down the hills and runs into the Great Barier Reef waiting there in the Coral Sea. To get there we had to do a few of things. One, hope and pray that the Wet held off so the road stayed open. Two, take a cable ferry across a crocodile infested river. Three, cough up a wad of dough to stay in a cabin tucked into the rainforest, just steps from the beach. We made it up the road and across the ferry. The road swooped and dove over hills and around curves. Thinking back on it I want to use words like “emerald” and “crystalline,” but I can’t because they sound silly. But I’d like to. All along the coast there were no buildings, not sign of civilasation. Trees leaning out over the white sand, tourquoise water lapping at the shore. Breath-taking. 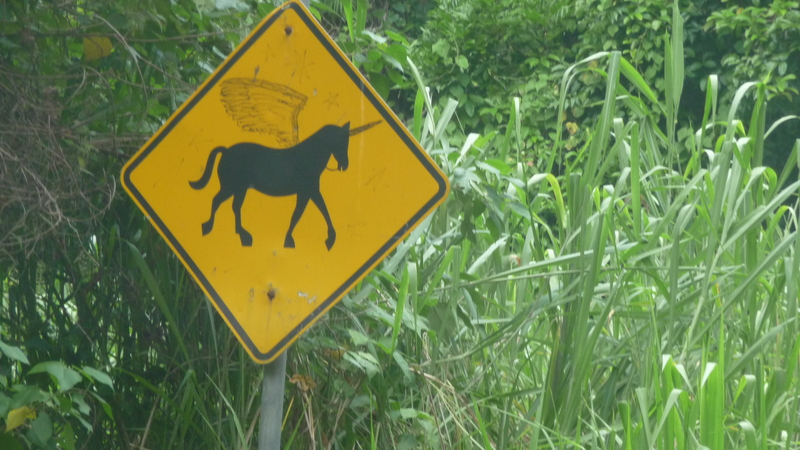 We followed the paved road past signs warning of cassowaries crossing, of cars washing over the sides of bridges in fast moving water, even past one warning of a flying unicorn crossing. We crossed bridges without sides and drove over creeks on square logs loosely joined together. Finally we drove past the end of the paved road and onto the track that leads to Cooktown, only 40 miles or so to the north. We were staying at Cape Tribulation Beach House, and we were excited. Well, it was my fault. See, the kids were so bummed about leaving the Wallaby that I kind of talked up the cabin to cheer them up. What a mistake. They took a couple of promises like “private cabin” and “a/c any time we want it” and turned the place into a mulitroom vacation home with flat screen tv and a sunken tub. The place never stood a chance. We had to park at the top of a quarter mile long path and lug our stuff down a hill to a cabin that had all the charm of a pressboard box. There was no glass in the windows, so to run the a/c you had to close the metal louvers on all three sides of the room, leaving it in total darkness except for a single bulb. There were the three promised beds, crammed in together. I thought to myself, Well, at least we can drink the water. Then, I drank the water. It tasted terrible. Within an hour Rory and I both were sick. It would have been funny if we had only had two toilets. 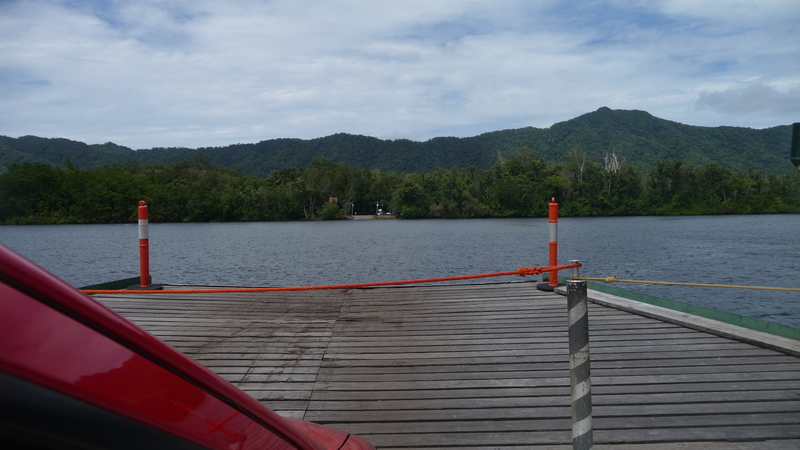 Thankfully the rest of Cape Trib and even our resort was so cool that we (okay, I) didn’t mind the disappointing cabin. A little further down the path was the main area, with a pool and a cafe and bar with tons of tables under a soaring canvas. Just beyond the pool on the path was one of the prettiest beaches I’ve ever seen. Unfortunately, it was the most deadly beach I’ve ever seen. The water was full of stingers, local slang for a collection of jellyfish (box jellies and their tiny cousins with a difficult name), lethal enough to slay a horse. And if the stingers don’t get you there’s always the chance that a saltie, a saltwater crocodile, will come up out of the surf and drag you away. We had a quick look, checked out some cool patterns made by burrowing animals in the sand, took a couple of photos and left. As Rory said, that’s just cruel. So beautiful, but so deadly. One cool thing we did in the Daintree was to go jungle surfing. Harnessed and striple-strapped to safety lines we zipped along through the canopy of the rain forest. We got five rides in all. 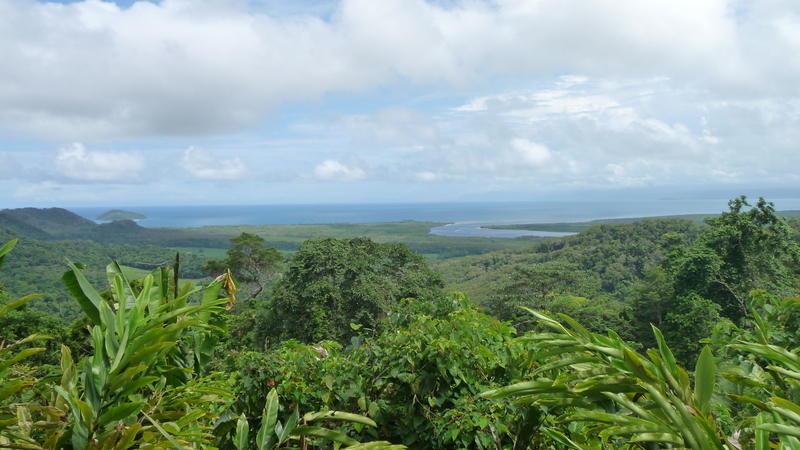 From the tallest tree perch we could look out over the top of the jungle to the sea in the distance. At our fastest we zipped along at 35 km/hour. Nora and Rory had a blast. Our only complaint? That it ended so soon. I don’t think I’ve done a good job conveying the feeling up there. It’s a jungle. All around you the green of a hundred kinds of palms and bushes and plants explodes. We didn’t so much stay on the path as we were kept to it by the rainforest. All day birds call and shout and insects click and buzz, then at night the sounds change to rustling and croaking and humming. There are just so many things up there living and breathing and growing and dying. The air is heavy and hot and smells rich. Both nights the rains poured down, hammering against the leaves as big as umbrellas. 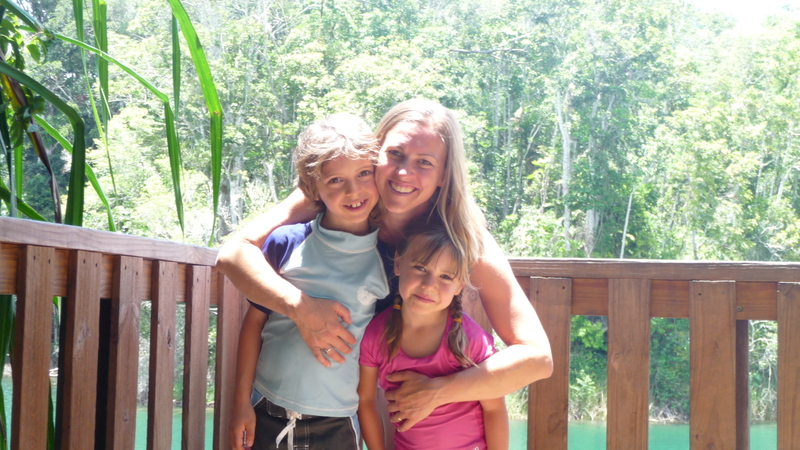 When I lived in Ecuador I went with Laura to her house in the Amazon. I remember sitting in her sunroom, reading by a lamp, and I could hear the bodies of huge insects slamming into the glass windows. 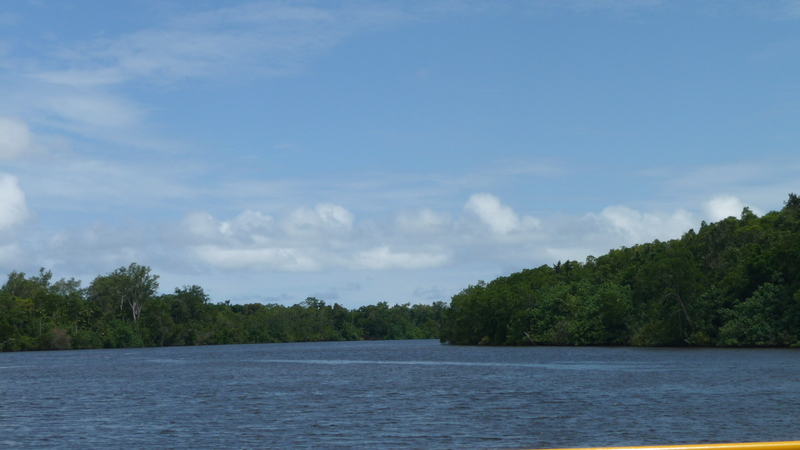 That’s what Cape Trib was like, and you could almost drink the water. Rory the lizard looks like one of your superheroes, or at least a character from Star Wars. 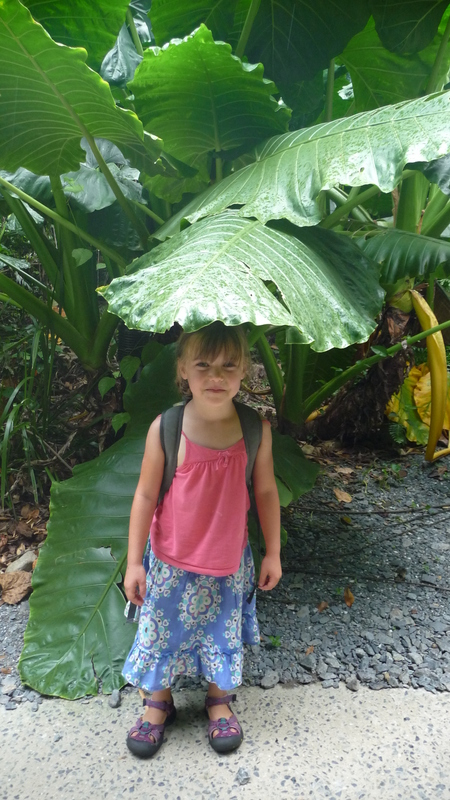 Nora I love your plant umbrella. Oh yeah, Momma you look cute too. I’d never felt a particularly strong desire to travel around Australia but after reading your stories Chrislyn, I have desire in spades.